The Champion of the Thames is another Cambridge pub with lots of character. There is a main room and a smaller side room, where we sat. 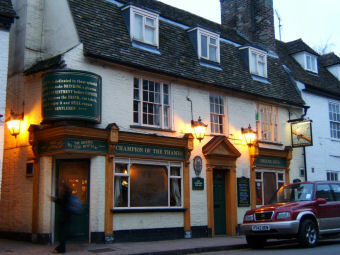 As a Greene King pub, Abbot & IPA are the regular beers. Guests were Westerham British Bulldog, Moorhouses Premier Bitter & Hadrian Border Tyneside Blonde. You can still do a decent crawl along this street. Excellent little pub, always worth visiting when in Cambridge. Called in on a return visit at the weekend. Nice little pub with well kept beers and friendly locals. Watched the rugby and had some craic. Would have stayed longer if there was some food; just snacky stuff please. We entered with trepidation given it's a Greene King joint, but it's a superior example of that breed thanks to a friendly old time atmosphere and the classic surroundings and we were greeted affably. The ales were just fine - if another brewery got its hands on it, it could approach legendary status. One of the few GK pubs I would visit insofar it's historic character and perhaps the odd unusual (GK) beer - 10 years ago it was Suffolk strong, this times it was the Reserve. Worthy of any pub crawl inclusion even through beer range is a little narrow.